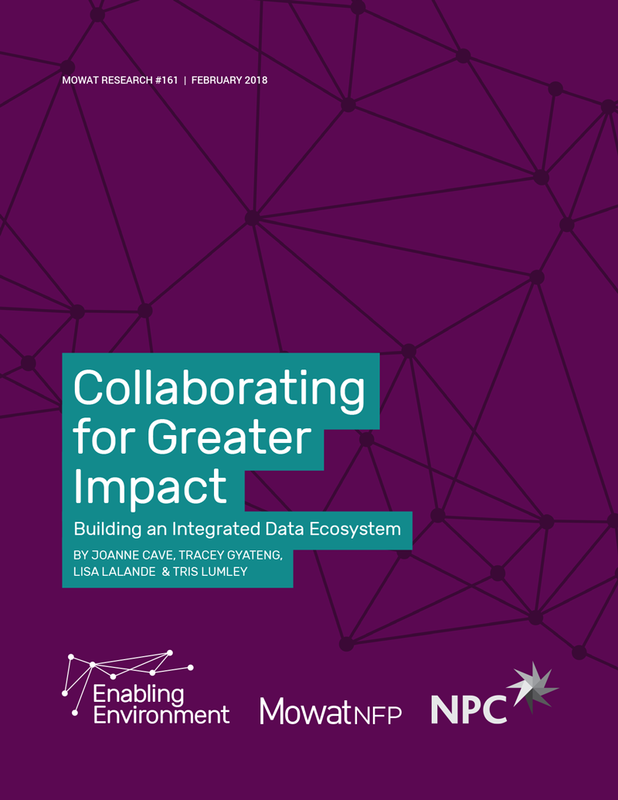 The latest report from Mowat NFP’s Enabling Environment series analyzes how charities, funders, governments and academic institutions can create a more enabling environment for data collection, analysis and sharing for the charitable sectors in both Canada and the UK. Data about the charitable sector is a strategically important asset. But as we move towards an enabling environment, it is increasingly important to focus on data that is accessed, collected, shared and analyzed by the sector as part of their service delivery, research, evaluation and policy advocacy activities. It is also important to recognize that the data used and produced by the charitable sector is part of a wider social sector “data ecosystem.” Adopting this approach, the paper articulates opportunities to advance charitable sector data policy and enhance organizations’ ability to deliver programs and services that are evidence-based, outcomes-oriented and responsive to the needs of the communities they serve. The paper provides a comparative perspective on charitable sector data usage in both Canada and the UK. This comparative approach is particularly relevant in the context of charitable and nonprofit sector data ecosystems, where the data landscape varies significantly by jurisdiction. The paper shares valuable lessons from both Canada and the UK regarding how charitable organizations have developed data infrastructure, collaborated on complex and innovative data projects and navigated the legislative and regulatory environment. This paper – a joint project between Mowat NFP, New Philanthropy Capital, and Imagine Canada – defines the data ecosystem, summarizes the charitable data policy context, and highlights key challenges and emerging trends. It provides actionable recommendations to build a more enabling environment for data collection, analysis and sharing. As a key service delivery partner with government, the charitable sector1 has a wealth of data on a wide range of issues – everything from environmental sustainability to homelessness and poverty reduction. Data is essential for a charity to be effective: it can be used to assess local needs and identify service gaps, inform organizational decision-making, understand trends over time, advocate for policy change, evaluate the outcomes and impact of programs and services and provide accountability and transparency to service users and the general public. However, charitable organizations, funders and governments have identified many data challenges within the sector, including a lack of technical skillsets and organizational capacity to collect, manage and analyze data and limited culture and incentives to share data and collaborate across organizations. Data privacy legislation and regulations are essential to safeguard individuals and organizations from data breaches but often require significant organizational expertise to ensure compliance. This paper provides recommendations to support charities, funders, governments and academic institutions in creating a more enabling environment3 for data collection, analysis and sharing. An enabling environment for data promotes openness, transparency and collaboration at all levels – from the overarching legislative and regulatory framework to the policies and procedures that govern individual organizations. Enabling environments provide the resources, tools and framework for organizations to maximize the potential value of their data. The recommendations in the paper are intended to support the transition towards a data policy framework for the charitable sector in both Canada and the UK. Charities are not alone in trying to make sense of the issues and challenges that come with being data-informed organizations; there is a broader “data ecosystem”4 that can work together to use data in an ethical, efficient and creative way. Using the concept of a data ecosystem, this paper articulates how Canada and the UK can move forward to advance charitable sector data policy and enhance organizations’ ability to deliver programs and services that are evidence-based, outcomes-oriented and responsive to the needs of the communities they serve. While data about the charitable sector is a strategically important asset, this paper focuses on data that is accessed, collected, shared and analyzed by the sector as part of its service delivery, research, evaluation and policy advocacy activities.